According to the logo designers, “its shape personifies the human brain, and represents the infrastructure base for our creativity. In illustrated concepts, the logo is surrounded by impossible shapes and eternal stairwells, which represent the information that swarms around us day after day; before embedding into our minds, changing, transforming and leaving as the start of an idea”. Look out for the tiny red ball that appears in each design execution. This represents ideas moving through our brains. 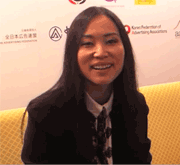 Heading the Design Army is Pum Lefebure, who was at AdFest 2015 as Jury President of the Design Lotus and Print Craft Lotus categories. Born in Thailand, Lefebure runs her design business in Washington DC. You can see and listen to her on our VIP interview. AdFest is now calling for entries. It is one of the world’s biggest annual advertising festivals. If you have some outstanding creative work you’d like to enter for this competition, or you want to attend the event as a delegate, go to www.ADFEST.com.